paste is one of those tools nobody uses . It puts two file side by side, line by line. One application for this came up today where some tool was called for several files at once and would spit out one line by file, but unfortunately not including the filename. After quite some time (years actually) of inactivity as Debian Account Manager, I finally decided to give back that Debian hat. I'm stepping down as DAM. I will still be around for the occasional comment from the peanut gallery, or to provide input if anyone actually cares to ask me about the old times. This will create the GitLab project in the chosen namespace, and import the repository from Alioth. Previously, it was solely paying attention to the version number in the top paragraph in debian/changelog, and would alert if that version didn't match the package version in Debian unstable or experimental. The idea is that "UNRELEASED" versions will keep nagging the maintainer (via DDPO) not to forget that some day this package needs an upload. This works for git, svn, bzr, hg, cvs, mtn, and darcs repositories (in decreasing order of actual usage numbers in Debian. I had actually tried to add arch support as well, but that VCS is so weird that it wasn't worth the trouble). The new mechanism fixes this for git repositories by also looking at the output of git describe --tags. If there are any commits since the last tag, and the vcswatch status according to debian/changelog would otherwise be "OK", a new status "COMMITS" is set. DDPO will report e.g. "1.4-1+2", to be read as "2 commits since the tag [debian/]1.4-1". Of the 16644 packages using git in Debian, currently 7327 are "OK", 2649 are in the new "COMMITS" state, and 4227 are "NEW". 723 are "OLD" and 79 are "UNREL" which indicates that the package in Debian is ahead of the git repository. 1639 are in an ERROR state. So far the new mechanism works for git only, but other VCSes could be added as well. I knew it was about this time of the year 10 years ago when my Debian account was created, but I couldn't remember the exact date until I looked it up earlier this evening: today :). Rene Engelhard had been my advocate, and Marc Brockschmidt my AM. Thanks guys! A lot of time has passed since then, and I've worked in various parts of the project. I became an application manager almost immediately, and quickly got into the NM front desk as well, revamping parts of the NM process which had become pretty bureaucratic (I think we are now, 10 years later, back where we should be, thanks to almost all of the paperwork being automated, thanks Enrico!). I've processed 37 NMs, most of them between 2005 and 2008, later I was only active as front desk and eventually Debian account manager. I've recently picked up AMing again, which I still find quite refreshing as the AM will always also learn new things. Quality Assurance was and is the other big field. Starting by doing QA uploads of orphaned packages, I attended some QA meetings around Germany, and picked up maintenance of the DDPO pages, which I still maintain. The link between QA and NM is the MIA team where I was active for some years until they kindly kicked me out because I was MIA there myself. I'm glad they are still using some of the scripts I was writing to automate some things. My favorite MUA is mutt, of which I became co-maintainer in 2007, and later maintainer. I'm still listed in the uploaders field, but admittedly I haven't really done anything there lately. Being a PostgreSQL consultant at work, it was natural to start looking into the packaging, so I started submitting patches to postgresql-common in 2011, and became a co-maintainer in 2012. Since then, I've mostly been working on PostgreSQL-related packages, of which far too many have my (co-)maintainer stamp on them. To link the Debian and PostgreSQL worlds together, we started an external repository (apt.postgresql.org) that contains packages for the PostgreSQL major releases that Debian doesn't ship. Most of my open source time at the moment is spent on getting all PostgreSQL packages in shape for Debian and this repository. According to minechangelogs, currently 844 changelog entries in Debian mention my name, or were authored by me. Scrolling back yields memories of packages that are long gone again from unstable, or I passed on to other maintainers. There are way too many people in Debian that I enjoy(ed) working with to list them here, and many of them are my friends. Debian is really the extended family on the internet. My last DebConf before this year had been in Mar del Plata - I had met some people at other conferences like FOSDEM, but meeting (almost) everyone again in Heidelberg was very nice. I even remembered all basic Mao rules :D.
So, thanks to everyone out there for making Debian such a wonderful place to be! The package is also waiting in NEW to be accepted for Debian experimental. 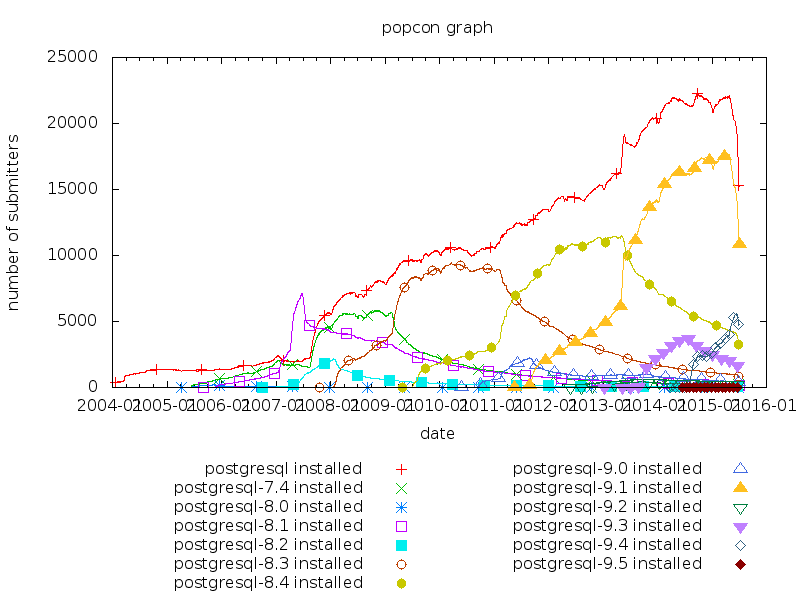 Before we included the PostgreSQL major version in the package name, "postgresql" contained the server, so that line represents the installation count of the pre-7.4 releases at the left end of the graph. Interestingly, 7.4 reached its installation peak well past 8.1's. Does anyone have an idea why that happened? The yellow line at the very bottom is the number of different source package names, currently 71. From that, a somewhat larger number of actual source packages that include the "pgdgXX" version suffixes targeting the various distributions we have is built (blue). The number of different binary package names (green) is in about the same range. The dimension explosion then happens for the actual number of binary packages (black, almost 8000) targeting all distributions and architectures. 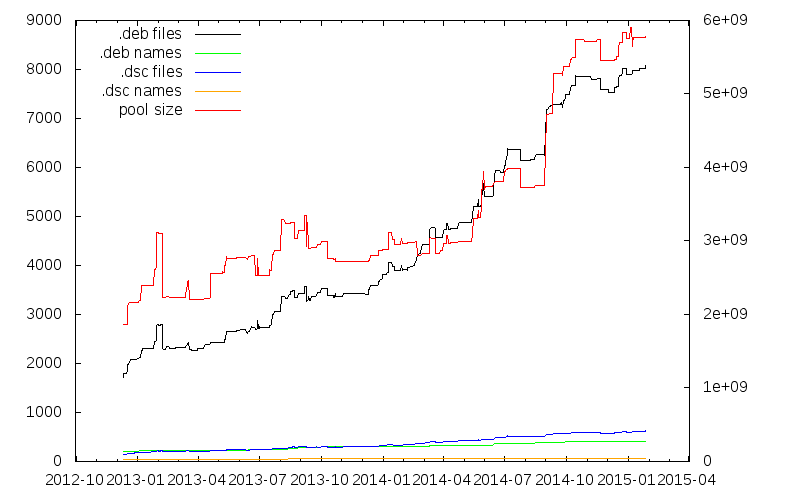 The red line is the total size of the pool/ directory, currently a bit less than 6GB.